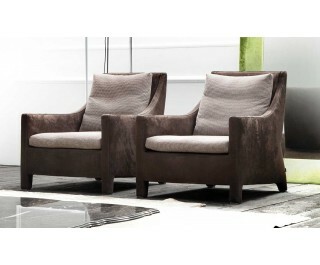 Pensiero by Erba is an armchair convenient and comfortable, from refined and elegant design with leg covered. Solid wood frame and multilayer wood, sprung seat with elastic belts and covered with polyurethane foam without CFC Seat virgin natural goose feather with polyurethane foam without CFC Back in natural goose feather 100% virgin. The model is available in fabric or leather.